I have not stopped giving thanks for you, remembering you in my prayers. I keep asking that the God of our Lord Jesus Christ, the glorious Father, may give you the Spirit of wisdom and revelation, so that you may know him better. I pray also that the eyes of your heart may be enlightened in order that you may know the hope to which he has called you, the riches of his glorious inheritance in the saints,  and his incomparably great power for us who believe. That power is like the working of his mighty strength,  which he exerted in Christ when he raised him from the dead and seated him at his right hand in the heavenly realms,  far above all rule and authority, power and dominion, and every title that can be given, not only in the present age but also in the one to come. And God placed all things under his feet and appointed him to be head over everything for the church,  which is his body, the fullness of him who fills everything in every way. "And God raised us up with Christ and seated us with him in the heavenly realms in Christ Jesus...."
Ephesians is such a rich and complex letter. It is so tempting to follow all the clues that Paul gives and Old Testament allusions he makes, and just revel in the letter itself, but I'll try not to do that. Rather, in this study I want to revel in the vision of the Church that Paul unfolds for us. Please understand if I skip lightly over some of your favorite verses. My focus is on the Church. In chapter 1 Paul greets the Ephesian readers (1:1-2) and then begins to enumerate our many spiritual blessings in Christ (1:3-14). He notes the Ephesians' faith and love (1:15), and now describes his prayer for them. Power that is focused on believers. It is "power in the church" that I want to examine in greater detail. "... His incomparably great power for us who believe." The word Paul uses for "power" is the common Greek noun dunamis, "potential for functioning in some way, the ability to achieve, power, might, strength, force, capability." Our words "dynamo" and "dynamic" come from this word. "Incomparably" (NIV), "immeasurable" (NRSV), "exceeding" (KJV) is a participle of the Greek verb huperballo, "to attain a degree that extraordinarily exceeds a point on a scale of extent, go beyond, surpass, outdo." "Great" (NIV) or "greatness" (NRSV, KJV) is the Greek adjective megathos, "quality of exceeding a standard of excellence, greatness." This is not just "power," but extraordinarily humongous power. But where is the power directed? What is this huge power designed to do? The Greek isn't precisely clear -- at least in this passage. NIV and NRSV translate the proposition eis as "for us" and KJV renders it "us-ward. The Greek preposition eis is a very common word that "indicating motion into a thing or into its immediate vicinity or relation to something." God's great power is extended toward us. We'll see in 3:20 later in this lesson that God's power is "toward" us and also works "within" us believers. In this sentence Paul adds two additional words to our power vocabulary that are rendered "mighty strength" (NIV), "great power" (NRSV), or "mighty power" (KJV). The Greek noun kratos means "ability to exhibit or express resident strength, might," here referring to "intensity in might." Kratos is combined with the Greek noun ischus, which means "capability to function effectively, strength, power, might." Great power! Mighty strength! In Paul's example, God has exerted just this kind of power in the resurrection of Christ from the dead. Think about that for a moment. The immense, infinite, humongous power that God extends to believers is the same sort of power that God used to raise Jesus from the dead. In other words, the power at our disposal as the Church can do the most impossible feat, crush the most unconquerable foe. This immeasurably great power is for us -- you and me -- who believe. Paul prays for the Ephesians -- and for modern-day readers -- that our spiritual eyes will be able to see and our faith will be big enough to grasp this tremendous resource. To understand this statement we need to define some terms. First, what does Paul mean by "heavenly realms" (NIV) or "heavenly places" (NRSV, KJV)? These phrases translate the Greek noun epouranios. Though it can refer to the skies and astronomical phenomena, here it refers to a locale for transcendent things and beings, "the spiritual sphere in which God, Christ, the powers of darkness and the believer exist together." Often we think of heaven as a place. Some people have been foolish enough to try map heaven as an astrophysical or geographical location. But physical space isn't the appropriate category. This is spiritual space, occupied by spirit beings. We humans exist in the physical realm where we are subject to physical laws of cause and effect, and have mastered them into a vast knowledge of physical and life science. But the "heavenly realms," as Paul speaks about them in Ephesians, refer to a spiritual realm where spirit beings -- God, angels, demons -- and we humans exist. We are strongly influenced by the spiritual realm whether we are aware of it or not (2:1-3). The noun epouranios could be translated "heavenlies," but I think the NIV's "heavenly realms" translates it best, since "realms" talks about the spiritual world as a dimension, whereas the KJV and NRSV's "heavenly places" lead us imagine physical locations -- the wrong mental construct. As I'll explain in a moment, Paul is deliberately using with the term "heavenly realms" a word used by pagan religions of his time. He does this purposely in order to communicate to his Gentile readers that Christ is supreme over any kind of spirit being that their former mystery religions might point to. The phrase "heavenly realms" is used four times in Ephesians to describe the arena in which spiritual power is exercised (Ephesians 1:20; 2:6; 3:10; 6:12). We've identified the arena -- the heavenly realms. Now let's see what it means to be seated there. "Seated" (NIV, NRSV) is the common Greek word kathizo, "to cause to sit down, seat, set." Here it carries the idea of installing a person in a place of honor. Marcus Barth translates it "enthroned," which captures the idea of authority and power that come with this position. In relation to the person of highest authority in a room, the place of honor would be a his right hand. And that is where Christ is enthroned, at God's right hand. A number of times in the New Testament, we see the promise and statement of Jesus sitting at God's right hand, in fulfillment of a Messianic prophecy in Psalm 110:1 (Matthew 26:64 = Mark 14:62 = Luke 22:69; Mark 16:19; Acts 7:56; Romans 8:34; Colossians 3:1; Hebrews 1:3; 10:12; 1 Peter 3:22). Assyrian king conquers, puts foot on neck of defeated king. In his Ephesian Letter, Paul uses both the ideas of "far above" and "under his feet" (1:22a). The phrase under his feet" is used for utter subjugation, both in the Old and New Testaments (1 Kings 5:3; Lamentations 3:34; 1 Corinthians 15:25-27; Hebrews 2:8). Jesus' exaltation echoes Psalm 8 which the Jews understood as referring to the conquering Messiah: "You made him ruler over the works of your hands; you put everything under his feet" (Psalm 8:6). Conquering kings would sometimes have the subjugated king kneel to the ground while the conqueror would put his foot on the defeated king's neck. At the fall of Baghdad in the Second Gulf War, ecstatic Iraqis pulled down the statue of Sadaam Hussein and then climbed on top of it. 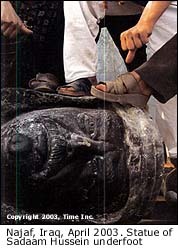 As the head of the statue was being pulled down the street various Iraqis would put their foot on it. Children would slap their sandals on it as a sign of utter contempt. So when we read the phrase in scripture, it has an important significance. To be under one's feet means to have complete power over one who has lesser power. "Principalities" (KJV) or "rule" (NIV, NRSV) is the Greek noun arche, "an authority figure who initiates activity or process, ruler, authority." "Might" (KJV) or "power" (NIV, NRSV) is the Greek noun dunamis, that we encountered in verse 19. Here it refers to "an entity or being, whether human or transcendent, that functions in a remarkable manner." "Dominion" (KJV, NIV, NRSV) is the Greek noun kuriotes." However, it becomes pretty clear that Paul isn't talking here about human political leaders and authorities. When you see how these words are used in Paul's letters (and 1 Peter), you'll see what I mean. I've used the NRSV translation, since it gives a consistent translation of each of these words. Romans 8:38, "nor angels, nor rulers ... nor powers"
Ephesians 1:21 "far above all rule and authority and power and dominion"
Ephesians 2:2 "... following the ruler (archon) of the power (exousia) of the air, the spirit that is now at work among those who are disobedient." Ephesians 3:10 "the rulers and authorities in the heavenly places"
Ephesians 6:12 "against the rulers, against the authorities, against the cosmic powers (kosmokrator) of this present darkness, against the spiritual forces (pneumatikos) of evil in the heavenly places." Colossians 1:16 "for in him all things in heaven and on earth were created, things visible and invisible, whether thrones (thronos) or dominions or rulers or powers-- all things have been created through him and for him." Colossians 2:10 "fullness in him, who is the head (kephale) of every ruler and authority." Colossians 2:15 "He disarmed the rulers and authorities and made a public example of them, triumphing over them in it [the cross]." (1 Peter 3:22) "... Who has gone into heaven and is at the right hand of God, with angels, authorities, and powers made subject to him." The point is that Jesus Christ is now in a place of full authority and power over every other spiritual being in the universe, save God the Father himself. To sit at the right hand of God with all these spirit-beings under his feet gives him total authority. We're skipping ahead, for a moment, to Ephesians 2:6, because I want you to see a startling statement in conjunction with what we read about "heavenly realms." If we are seated with Christ in the spiritual authority hierarchy, that means that we, too, are seated far above all spiritual powers. If demons and evil spirits are "under his feet" then they are under our feet, too. Do we deserve this position in Christ? By no means! "It is by grace you have been saved, through faith -- and this not from yourselves, it is the gift of God..." (2:8). Do you understand? Does this stretch your categories? I hope so. Grasping your spiritual place and your spiritual authority are vital to both your Christian maturity and your spiritual warfare. For you battle against the spiritual forces of evil (6:12) not from a position of weakness, but of strength. Not from a place of inferiority, but of superiority. Yes, it is all by grace. But it is true and it is real. Believe it! Act on it! This echoes an earlier sentence in this letter about God's purpose: "to bring all things in heaven and on earth together under one head, even Christ" (1:10). "Head" in these verses doesn't necessarily imply a head-body analogy. Rather, in Hebrew, the word "head" is often used of the leader of a people or tribe. The Greek word kephale, "head," means in this instance "a being of high status, head." Here Christ is head over all created things -- humans, angels, spirit beings, animals, the earth, the universe -- everything. What is the purpose of this headship? Both the unity of God's creation and to fulfill God's plan. We see this phrase: "To be head over everything for the church" (1:22b). The phrase "for the church" uses the dative case rather than a preposition, probably to be understood as the dative of advantage. If Christ is head for the Church, it means that he plans to use the Church in the exercise of his power and authority. Does the Church have power at its disposal? Oh, yes! -- to the extent that we are in tune with Christ's mission and purpose. "the global community of Christians, '(universal) church" (for example, Ephesians 1:22). "God ... appointed him to be head over everything for the church, which is his body." "Through the church, the manifold wisdom of God should be made known to the rulers and authorities in the heavenly realms." "To him be glory in the church and in Christ Jesus." "For the husband is the head of the wife as Christ is the head of the church, his body." "... As the church submits to Christ, so also wives should submit to their husbands." "...To present her to himself as a radiant church ... holy and blameless." "No one ever hated his own body, but he feeds and cares for it, just as Christ does the church." "This is a profound mystery -- but I am talking about Christ and the church." In each case Paul seems to be speaking of the church in a universal or spiritual sense. But we shouldn't assume that Paul doesn't care about the individual congregations in Ephesus. He does. The principles derived from the general, spiritual conception of the church are to be applied in each congregation where we find ourselves. More on this shortly. We'll look at the concept of the church as body of Christ in lesson 4. In other places Paul uses the concept to express the ideas of organic unity, mutual dependence, and multiplicity of functions. But what does this mean to us as congregations? As individuals? Jesus' own physical human body is no longer on earth. Now we are his body. My congregation and yours are Christ's hands reaching out to help the poor, the needy, and the lost. We are Christ's feet visiting and bringing a healing and freeing word. We represent Christ in our community in a visible and tangible way. And since we are Christ's visible extension to our world, we can operate with all his own power and authority. "Fullness" is the Greek noun pleroma, "that which is full of something." A century after Paul wrote Ephesians, pleroma acquires the nature of a technical term in the vocabulary of Gnostic writers to describe the mysteries of the cosmos, the soul, and redemption. But it is a mistake to think that Paul's writings were influenced by some kind of incipient Gnosticism. More likely, Paul is deliberately using words familiar to his readers familiar with mystery religions and employing them to demonstrate to these new Gentile Christians the completeness of Christ. The Church has power and authority because we are full of Christ! We are designed to be the full expression of Christ on earth. Now we can be presumptuous and assume that everything we say is authoritative. But dogmatism isn't the idea at all. Rather, it is very humbling that think that Christ fills, and seeks to fill, his Church with his full presence. If your congregation seems pretty dry, then this is a call for repentance and seeking that Christ might fill his churches -- your church -- with his fullness once again! Fullness of Christ is part of our vision for the church. My mental image of the fullness of Christ and his Spirit is like compressed air. Yes, he "fills everything in every way," his presence is everywhere. But his presence is especially to be in the church. Like tires, we can leak and become flat. We need to check the pressure often and, when necessary, go to the pump and get filled to proper operating pressure. We seek to be filled with more than hot air, but with Christ and his Spirit in fullness! We are considering these two verses out of their immediate context, but as a doxology (literally "glory-saying"), they stands as a summary of our praise to God as we have become aware of all Paul has taught us about Christ and his Church thus far. The phrase "immeasurably more" (NIV), "exceedingly abundantly" (KJV), or "abundantly far more" translates the Greek adverb huperekperissou, which means "quite beyond measure," the highest form of comparison imaginable, a compound word from hyper, "over, above, beyond" + ek, "out of" + perisseuo, "to exceed, to be abundant." When you say someone is "hyper" (or "hyperactive") you mean they are way above the normal activity level. "Super abundant" is the idea of this word. So Paul reminds us that God is able to work "super abundantly" more than we can even imagine in our wildest prayers. We are usually too full of unbelief to pray such bold and "over the top" prayers that put into words what God is able to do. But see the locus of this power -- "according to his power (dunamis) that is at work within us." God's super abundant, miraculous answers to prayer many times come as a result of God's power that is resident in and working in his Church. The phrase "at work" is the Greek verb erergeo, "work, be at work, be active, operate, be effective," from which we get our word "energy." Miracles? Why not? What is to keep gifted members of the Church from exercising power gifts to see miracles, healings, great works of salvation and wholeness. Dear friends, the Church in history has seen great things, but those times are not over. Not by any means! As we believe God's promises, we have just begun to see his greatness evidenced in our midst. God's super abundant power is designed to energize and activate his church with power to accomplish his plan here on earth. Pray for this power. Imagine this power working in your congregation. Envision it. Begin to expect it day and night. And as you do, as your faith rises, you will begin to see Christ's power in your church to a greater degree than you ever believed possible. That is what I get out of this passage! Yes! Glory, "honor as enhancement or recognition of status or performance, fame recognition, renown, honor, prestige." Not just in the first generation, the generation of the apostles, of St. Patrick, of St. Francis, and John Wesley. But in our generation also. Let great glory be to God and to his Christ as we believe in and exercise God's exceedingly great power given for the Church, to be displayed in and through his Church. Now and forever. Amen. Father, I have sometimes been so cynical about the church that I couldn't see you working. I haven't believed that you have really invested the church with power -- and the church has lived up to my low expectations. But I ask you to forgive me and cleanse my mind of my unbelief and unscriptural conceptions of the church as just a human institution. Instead, create in me and my brothers and sisters the kind of faith through which you can operate with your power. Do it in my congregations and the congregations of each and every person who reads these words and prays this prayer. In Jesus' mighty name, I pray. Amen. (Ephesians 1:19) Why does Paul pray that God would open the Ephesians' eyes to discern "his incomparably great power"? What is wrong with their eyes? Where does this power operate according to 1:19? Which miraculous event does Paul use as an example of this level and type of power? (Ephesians 1:20-22) The Ephesian Gentile Christians believed in various spirit beings that exercised power over them. What is the significance to them of Paul saying that Christ is seated at God's right hand in the heavenly realms? In what sense are these spirit beings and powers "under his feet"? (Ephesians 2:6) From the standpoint of power, what is the significance of Paul's statement that "God raised us up with Christ and seated us with him in the heavenly realms in Christ Jesus...."? (Ephesians 1:23) What does it mean for us Christians that Christ is "head over everything for the church"? What does this say about the Church's power? (Ephesians 3:20-21) Where does God's power work according to verse 20? How much power is at work there quantitatively? Why isn't it more evident? How does exercising Christ's power on earth bring glory to God? BDAG 262; Otto Betz, "dunamis," NIDNTT 2:-601-606. Danker (4.g) notes that often eis = "for" in general, and cites this verse. BDAG 288-291. BDAG 565. Kratos denotes "power and strength," such as physical strength, or the power possessed by men, rulers, or gods. It can also be a title of royalty as a well as to mean "rule or dominion" and "victory."(G. Braumann, "kratos," NIDNTT 3:716-718.) Danker translates the combination of the two words in our passage: "the working of his strength = mighty strength" (also in Ephesians 6:10; BDAG 565). BDAG 484; G. Braumann, "ischus," NIDNTT 3:712-714. "Exerted" (NIV), "put ... to work" (NRSV), or "wrought" (KJV) is the Greek verb energeo, from which we get the English word "energize." Here it means "to bring something about through use of capability, work, produce, effect" (BDAG 335). John F. Maile, "Heaven, Heavenlies, Paradise," DPL 381-382. "The reason for this use of the plerophoric expression en tois epouraniois, which is taken from the cultic vocabulary of paganism, is to be sought in a growing liturgical and apologetic interest" (Helmut Traub, "ouranos, ktl.," TDNT 5:497-543). Danker calls the kuriotes "a special class of angelic powers, bearers of the ruling power, dominions." (BDAG 579). Dative of advantage "serves to designate the person whose interest is affected" (BDF �188, p. 100). BDAG 303-304.; Karl Ludwig Schmidt, "ekklesia," TDNT 3:501-536. Barth, "Comment VI. Head, Body, and Fullness," Ephesians 1-3, pp. 200-201. BDAG 1033. It is used in our passage as well as 1 Thessalonians 3:10 ("pray most earnestly") and 5:13 ("hold them in the highest regard").